"The Iron Giant: Special Edition" marks the return of the animated cult classic to theaters after 15 years. With two additional scenes and completely remastered, director Brad Bird's powerful and endearing story of a boy who befriends a giant robot from space must try to avoid an overzealous federal agent and the U.S. military. 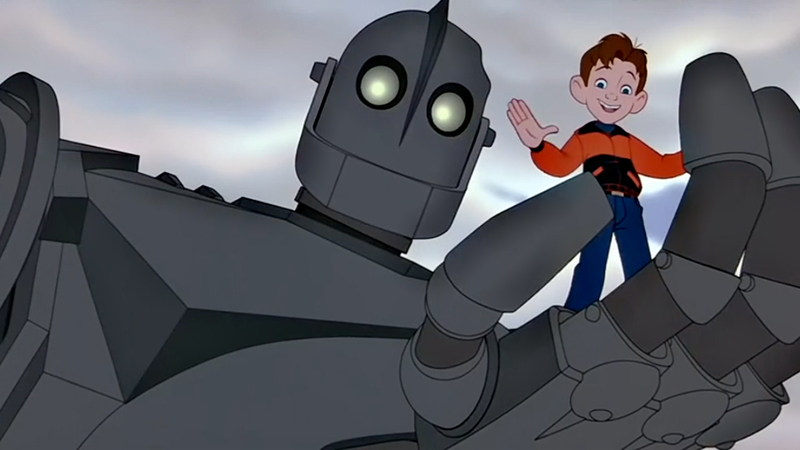 Based on Ted Hughes' novel and set in 1957, 'The Iron Giant' featured some beautiful retro-looking animation that unfortunately, didn't find an audience when it debuted in 1999 despite critical acclaim. It was revived on DVD making it a fan favorite for its endearing characters and deeper than usual themes for an animated film. Bird didn't make another film for Warner Bros after the studio bungled the marketing for 'Giant.' They had shown interest in Bird's script for a little movie entitled 'The Incredibles' but he and about 15 animators were subsequently hired by Pixar and the rest is history. Fathom Events is releasing the film on September 30 and an encore in limited markets on October 4. The Blu-Ray edition will be available in the fall. The voice cast included Eli Marienthal, Jennifer Aniston, Harry Connick Jr., John Mahoney and a young Vin Diesel.